Southquay Greenway is Canberra’s newest waterfront precinct located along the shores of Lake Tuggeranong. Once complete, the precinct will consist of over 1,000 dwellings and more than 3,000m2 of commercial space in the heart of the Tuggeranong Town Centre. The entire urban precinct of Southquay Greenway will consist of 12-13 sites along the eastern and western sides of Lake Tuggeranong. All eight sites positioned on the western side closest to Anketell Street were sold at auction during 2014-2015. The next stage of the Southquay development, between Lake Tuggeranong and Drakeford Drive is scheduled for sale in the second half of 2017, consistent with the ACT Government’s Land Release Program. A development application (DA) for the development of estate works the eastern side has been publicly notified. The project will consist of four to five blocks of land, with the development of the fifth block (the most southern and adjacent to Isabella Weir) being subject to a referral to the Commonwealth Government to identify and address environmental issues. The development will include a signalised intersection on Drakeford Drive to provide safe and convenient left and right turns to provide access in and out of the development, a shared path on the lake front completing the path network around Lake Tuggeranong and landscaping of some areas around the development to compliment the area. 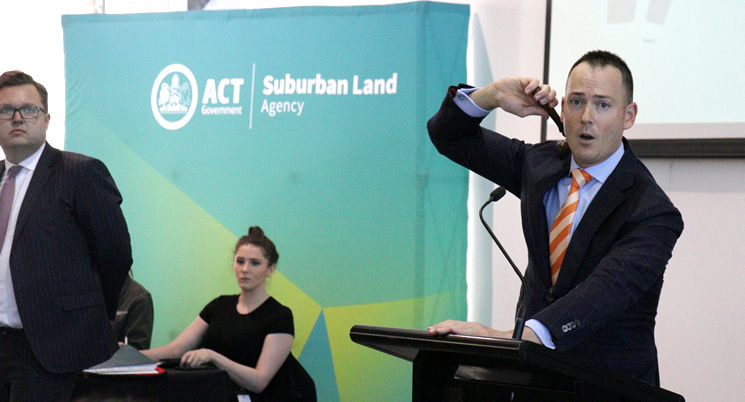 The ACT Government held drop-in information sessions on 25 January, 4 February and 3 March 2017 about Southquay East at the Tuggeranong Hyperdome and at the Lanyon Marketplace. Future project updates will be available on this website. The ACT Government is investing significantly in the development of the lake foreshore and the provision of a new central park to make this picturesque location a desirable destination for locals and visitors alike. Southquay Greenway will be the perfect place to catch up, relax over a coffee and play, with easy access to on site street front cafes, paths for cyclists and pedestrians and a children’s playground. Please note that the children's playground will remain closed until construction activities on the adjacent building site are complete. The rest of the Tuggeranong Town Centre is within walking distance and with Anketell Street as the central public transport route, Canberra’s other town centres and employment hubs are also an easy connection. Southquay Greenway's Nina Farrer Park is Now Open!